Here is the Missing Number Maths Puzzle to test your Logical reasoning as well as Mathematical skills. 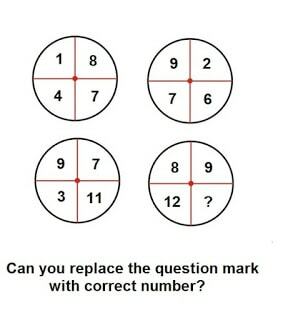 Can you find the pattern in the following Picture Puzzle and then find the missing number which will replace the question mark? The Answer to this Maths Puzzle will be given later once some users try to solve it and write the answer in the comments section. Please do post your reasoning along with your answer for this missing number math puzzle.